We got a bit of a surprise the other day when checking the eggs. 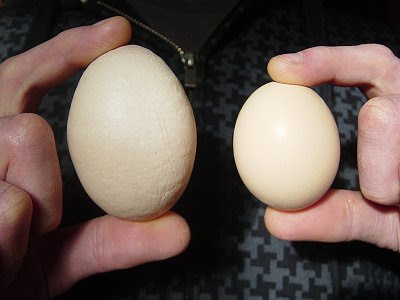 One of our chickens had been quite busy and had laid a rather large egg. It had a double yolk inside... which I used to make a really nice chocolate slice! Spot the difference. There are 9 differences to find in this image. Wow, cant beat fresh eggs everyday. Wowzers..I've got one word: OUCH! Wow! The pushing she must have done to get that one out - hee hee! you want to feed that chook more often!! I agree with Anya!